US Navy Flag was a 5-1 shot to secure a second Group One on the bounce following his Middle Park Stakes triumph a fortnight ago. US Navy Flag provided O'Brien with a 24th top-flight success of 2016, leaving him just one short of the record set by American trainer Bobby Frankel in 2003. Moore told ITV Racing: "He's been a remarkable horse. From the middle of the summer we've started to work him out. "He's very tough. I thought it was going to be a very good Dewhurst. 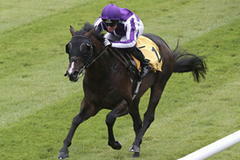 "To win a Middle Park and then to come and win a Dewhurst is great and he was strong at the line. "It's a massive feat again, what Aidan has done." US Navy Flag is a full-sister to Roly Poly, who secured her third successive top-level win in last weekend's Sun Chariot Stakes. "They're amazingly similar," Moore added. "Neither of them are the biggest, but they'll both give you absolutely everything. This lad would have a little more substance about him. "They both seem to keep getting better every time they come to the track." Connections of the disappointing Expert Eye remained baffled by his performance the following day. 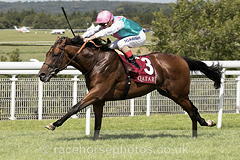 The Sir Michael Stoute-trained juvenile looked a potential superstar when winning the Vintage Stakes at Goodwood. With that form working out incredibly well as James Garfield subsequently won the Mill Reef Stakes and Seahenge the Champagne Stakes, confidence was high going into the Group One. However, Expert Eye, having raced a little keenly early on, was one of the first beaten under Andrea Atzeni and he trailed home last of the nine runners. It was initially reported he was lame on his right hind, but he later trotted up sound. "Everything is fine with him this morning," said Teddy Grimthorpe, owner Khalid Abdullah's racing manager, on Sunday.